At the heart of the Christmas celebration is the birth of a baby – a certain baby whose life, ministry, and message will bring new life to the world and offer new paradigms for us to consider. Though the story of Jesus’ birth as told by Luke is much loved, and though the theological reflection and framing of that birth as found in the prologue of John offers much profound reflection and beauty to the day, often times the other readings of the day are overshadowed by the greatness of the Gospel writers and our fondness for stories about babies. The proclamation in Isaiah is easily misunderstood to simply be a prediction of the birth of Jesus – something which was not even on the minds of those who authored the various portions of this beloved book in the Hebrew Bible. The same interpretive perils often befall the Psalms appointed for Christmas Eve/Day – or they are omitted altogether. And for most readers and hearers of Titus and Hebrews, the interpretive framing is looking back to the birth of Jesus, when instead their respective authors were intending for their readers and hearers to look forward. What do these “extra” readings have to offer us that is something beyond the baby lying in the manger? And how might the readings be inviting us to look beyond the manger into the future? There is no doubt in my mind that the three portions of Isaiah selected for the Christmas Eve and Day lectionary are there because they each offer a witness to what their authors perceived to be God doing new things in the midst of their ancient communities. Isaiah 9 outlines the novelty which is brought about by God moving the people from darkness to light, from oppression to freedom, from deep hopelessness to great joy. The obvious parallel of this passage with the Nativity narrative is the appearance of a baby boy. The baby in the prophet’s context, however, was not a messianic birth, but rather simply a sign that there is a new reality being born in Israel’s midst, and that they were part of that new thing which God was doing in and through and among them. What new thing might God be doing in us? What is God trying to give birth to in and through and among us in the here-and-now? Isaiah 62 witnesses to the novelty of peace – a deep, abiding peace after the ravages of war and exile. The new thing being done by God for the people is that there will be no more invasions or occupying forces, that they themselves will eat the grains of their fields and drink the wines of their vineyards rather than forcibly exporting it all to an occupying enemy. The prophet invites the community to join in the proclamation and the witness to the new thing by instructing them to open the gates for those returning, and to clear the stones out of the streets that were the evidence of defeat. And yet another novelty is the renaming of the peoples – the returning exiles are to be called “Holy People” and “Redeemed” while those who were left behind in Jerusalem are to be renamed “Sought Out” and “Not Forsaken.” There is much power in a name; but that power can be redirected and celebrated in new ways when it is reframed! What new names might God be inviting us to take for ourselves? Isaiah 52 extols the beauty of the feet of those who proclaim good news. Again, the new thing being celebrated is the return of those who were in exile. Their return signals a new era filled with peace, good news, and salvation. The return of the exiles, according to the prophet, is also a sign that God is returning to Jerusalem with them. Even the ruins themselves are singing about this new day being heralded by their return! What devastation in our own lives is God inviting to sing? What aspects of ourselves have been long in exile and are now being brought back home where we belong? Psalms 96, 97, and 98 also bear witness to the birth of novelty into the world of ancient Israel – two of them specifically invite us to “sing a new song.” In all three of these Psalms, nature itself breaks into singing and rejoicing because of the wonders that God is doing “in the sight of the nations.” In the Christmas celebration, the imagery of these Psalms is often lost because they are often omitted from the lectionary for the day. In part, this can make sense, given that there is so much territory to cover from the perspective of the Gospel story. But at the same time, there is much to be said for inviting a congregation to utilize this poetry in a way that honors the context for which it was first intended – the celebration of God’s love and wonder as experienced by ancient Israel. One way to get a Psalm in (and simultaneously get in another Christmas carol) is to replace the Psalm with Isaac Watts’ famous hymn “Joy to the world! the Lord is come!” which is a paraphrase of Psalm 98, and which also includes imagery found in Psalm 96:11-12. Using that hymn at other times of the year will help to make that connection in peoples’ minds! For Luke’s congregation, there would be horror at our traditional notion that the manger where Jesus was laid might have been in a stable out back; more than likely the manger would have been in a room of someone’s home, indicating the radical sense of hospitality which was (and is) commonly extended in and around the Middle East. Additionally, in ancient Rome, whenever one of the Caesars was born, it was not at all uncommon to have it told abroad through the empire that this birth was heralded by heavenly beings making the announcement to the Roman Senate. So imagine the shock, wonder, and awe – not to mention the outrage! – at the idea of heavenly beings announcing such news to a flock of shepherds, whose social station in the ancient world was lower than low! It’s no small wonder that Mary pondered all these things in her heart – it’s a lot to take in! In what radical ways might this story be inviting us to stand over and against the imperial forces of our day? How might we reframe the metaphors of imperialism to proclaim the good news of peace and goodwill? The beloved words of John’s prologue provide theological reflection on the Christmas story. This reading is often reserved for a traditional “Midnight Mass” or as a Gospel reflection on the birth of Jesus for Christmas Day, rather than Christmas Eve, because by the time of a morning service, after the dawning of the sun on the date of the Feast, is found a literal example of “the light coming into the world” and a testimony to how “the darkness did not overcome it.” It is in John’s Gospel reading for Christmas Day in which we hear the proclamation that “the Word became flesh and lived among us” – another novelty wherein God comes to earth entering into the human experience. From a process perspective, this is especially poignant as one of the prime process paradigms is the notion that God truly feels everything which we do – every pain, every ache, every joy, every achievement, every love, every sorrow, every question, every doubt. How are we being invited to testify to the light of the world? And how and where do we see God in the flesh? Turning now to the Epistles, what might happen if a preacher were to read one of these after the Gospel reading? When these readings are used for Christmas, as mentioned earlier, most of us hear them with the idea that the author is looking backward in time to the manger. But what if that wasn’t the case? What if the intent of the author were to inspire those who read their words to look at the present moment, and then to look forward? In Titus 2, the “new thing” which the author is suggesting is to look at our lives “in the present age” in light of the grace of God which was born/borne into the world in and through Jesus. And because we connect that past event to our current moment, we can join with (as process people like to put it) God’s initial aim, which is luring us toward living lives that are “self-controlled, upright, and godly” all the while looking toward the open future in hope. Again, in Titus 3, the author invites us to look back to the time that God’s “goodness and loving kindness” appeared in Jesus, as well as the mercy of God which we experienced in our own baptism. And in the present moment, the author is challenging us to also look forward to becoming “heirs according to the hope of eternal life.” Because of Jesus’ birth and message, and because of our own experience of baptism, we are being challenged to see these pieces of our past as uniquely qualifying us to look to the future with new eyes. Then in Hebrews 1 we find another prologue (the shorter version of which, v. 1-4, is probably sufficient to make all the Christmas connections), the author states that in the past, God spoke to us through prophets, and more recently through a Son. The author then switches into the present tense, stating that the Son “is the reflection of God’s glory and the exact imprint of God’s very being…” The fact that this part is in the present tense indicates that it is something which is still true and ongoing, and we are being invited to look around us to discover where we might see God’s glory reflected, and where God’s very being is being imprinted into our world. Of the three epistle readings, the reading from Hebrews is the most overtly incarnational in its imagery and metaphor. But all three of them point to the reality of God being brought into the world in ways which invite us to see the present moment in new ways, which then invites us to have new, renewed, and renewing vision for the future. What possibilities might wait for us in the open future because of our encounter with any of these stories and readings? How are present circumstances in our own personal and corporate lives being reframed because of the novelty which God is eternally offering to the world? How are we invited to incarnate God’s initial aim, each in our own contexts? If our adoration of a baby in a manger isn’t challenging us to “comfort the disturbed and disturb the comfortable” (as an old saying goes), it means that we aren’t paying attention to what this birth is about, and how the readings we share this day are inviting us to look with new eyes toward the future. The Rev. David Grant Smith is a priest in the Episcopal Church, and is presently pursuing the D.Min. degree at Claremont School of Theology, focusing his studies on process theology as a resource for parish ministry and spiritual care. While at CST, David is thrilled to be currently working as the student assistant for Process & Faith. 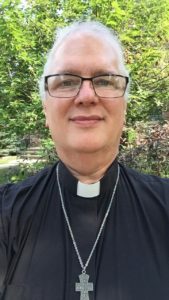 He has served in both parish ministry (Episcopal Diocese of Rochester) and as a hospital chaplain (Christiana Hospital in Newark, DE; and the Johns Hopkins Hospital in Baltimore, MD). Prior to ordination, David worked for many years as a lay professional, serving as pastoral associate, choir director, organist, and minister of music. In addition to his interests in weaving Process Theology in and through preaching, liturgy, teaching, and pastoral care, David enjoys travel, writing, tea, wine, and spending time with family & friends.